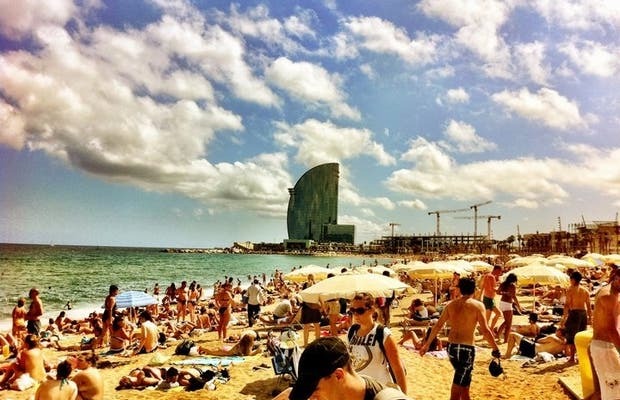 Barceloneta beach is always packed, all year long. With tourists getting a tan with temperatures locals consider freezings, swimming, playing volley ball, tennis. There are some fishermen, musicians, groups of friends having lunch on a terrace, people passing by, jogging, etc. This neighborhood of Barceloneta is an old one in the city of Barcelona, where the sailors who worked in Port Vell used to live, as well as the people who had been expelled from their houses in order to build the Ciutadella park next to the Gothic Quarter. The narrow streets look like an Italian neighborhood, with clothes hanging out the windows, people on the sidewalk watching TV because it is too hot in their house, or because they prefer being there to talk to the neighbors. It looks like it sustains life, independently from the big city 500 meters away. It is true that the water is not very clean, but as it a big-city beach, so it's absurd to expect crystal clear water. What makes it special is not the water, it is the incredible atmosphere you can feel. The good thing about it is that it is very accessible, since it is a few minutes away from the metro station. If you want a more dynamic atmosphere I recommend going during the high season, when there are more activities to do and more people. I like going during the rest of the year, since it is ideal to relax with the sound of the sea and to have a walk. There aren't many beautiful beaches like Barceloneta so close to the center of Barcelona. However, no one coming to Barcelona in the summer should miss out on this centric and packed beach. This narrow spot of sand, pushed against the sea by the old buildings of the sailors' neighborhood and by a square where the sun reverberates on the cement, is the place people of Barcelona who cannot get out of the city choose to enjoy some fresh air and the sun. It is also the favorite one for thousands of tourists, who lie on the sand all day until the sun sets, only to them go get some drinks! One of my favourite places, is very pleasant when you go to one city break, to have also beach near town. The water was good, warm when we traveled there, in june 2014. The sand rich and very pleasant. We eat a good paella nearby. Areas for disabled people with assisted bathing service, public telephones, showers, public fountains, lockers, rubbish bins and recycling bins but it seems that now one use this bins, the true is that till night the beach becomes a garbage beach, such a shame. And Barcelona is a really beautiful city, in addition of that, the sand beaches of Barcelona is so special, I loved Barcelona Beaches, all of them ! totally recommend them! Spiaggia libera, molto affollata. che mi è piaciuto molto sono il mare pulito e i bar che ci sono (ho preso ad uno di essi un mojito analcolico molto buono)!